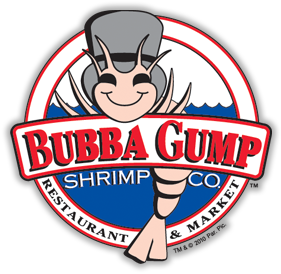 Shop | Bubba Gump Shrimp Co. The memorabilia displayed in the restaurant is bound to delight fans of ‘Forrest Gump’ and visitors to London alike. The market stocks t-shirts, glassware, hats, DVDs, cook books, license plates and plenty more. Gift card value is valid for 12 months from the date of purchase. Value can be redeemed at Bubba Gump Shrimp Co (London ONLY) against food, beverages and merchandise. Additional payment is required for postage fee. Value is not refundable nor exchangeable for cash. Value can only be added in Pound Sterling. Gift card is not valid in any Bubba Gump Shrimp Co outside of the UK. Gift card can not be re-issued if lost or stolen. We will aim to deliver within 3 to 5 working days after posting. 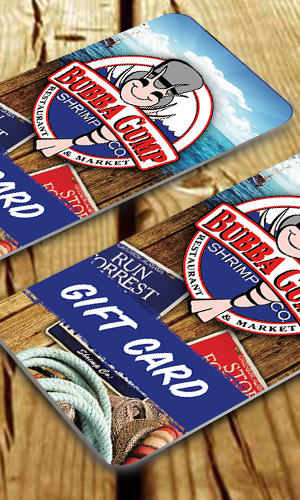 Please contact shop@bubbagumpshrimp.co.uk if you have not received the gift card within 10 days of purchase.